Ever Winter Review and Giveaway! 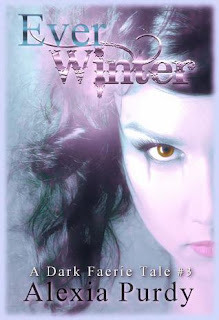 Ever Winter by Alexia Purdy! These Ancients of Faerie don’t want her to succeed, and the wards between the land of Faerie and the mortal world are blurring rapidly. Shade must face treacheries in every crevice of the land, even among the human mortals and trusted allies, before all is lost. Dylan is back booyashacka mutha f*cka! So totally inappropriate for a review, but it’s my review so I’m gonna be like that and shiz. Anyway. LOL. This book begins with Shade recovering from her imprisonment, by Aveta, on a beach in Fairie. Her magic has been bound by Corb and she feels lost and isolated. Her feelings for Soap, while still there are not as intense as they are for Dylan (Me so happy. I like Soap, but I love Dylan….kinda like Shade.) In order to get her magic unbound Shade must go to Corb and get him to undo his magic on her. And so begins our quest…. And what a quest it was. ACTION packed. Shade never gets a moments peace poor girl. There are twists and turns in this book that I did not see coming. These books keep getting better and better and better. I love them. How many are there going to be Alexia? Cuz I want, need, no DEMAND more! Alexia’s strong point as a writer, is her writing. She doesn’t need typical tricks to lure readers in. She weaves a magical, hypnotic spell with her words and then blows us away with her epic skills. She really, really shines when writing action filled scenes and this book is not short on them. Overall, in my opinion, the best of the series yet. I am in love with it, and want to re-read it some day soon. Also, will be buying the autographed copy for my collection. **Buy purchasing the book through this link, I will be getting a small kick back. You get the same product at the same price.